As children, my sister and I would always dread our judgement day, the day when our annual results came out. We made sure we watched all the movies we wanted watch, ate all the ice-cream we wanted to eat, before the annual open house at school. After all we were not the toppers of the class, we were the naughty, talkative ‘last benchers’, and the parent teacher interaction was never welcome. So, this dinner at the Marriott Hotel for my sister’s first year result for her Bachelors in Arts, was a rather rare and special occasion for all four of us. It was a happy Thursday evening in the beginning of June. The Pune air was cool, the staff at the Marriott hotel was warm and upon entry into the spacious Italian restaurant Alto Vino, the ambience looked chic and, well, brown! with the contemporary wooden interiors. The only thing that was lacking from this otherwise perfect evening was the quiet. There was a lot of noise and hustle-bustle in the restaurant for I which I can hardly blame the restaurant staff. We were all excited about my younger sister’s result and we did not let the noise come in the way of our celebration. When you and I step out to enjoy a meal, we know that we can easily find delicious food anytime of the day and at a price that does burn a hole in our pocket. Although, Daddy was paying tonight, I was a little more critical of the food and the service because I knew that he was shelling out more than he would on a random regular meal on the weekend. I started the evening with a classic Martini; something that you cannot go wrong with, it was piquant, perfect! As I sipped my cocktail, I looked around to find most of the tables occupied on a weeknight, a lot of the tables were occupied by families, this being the last leg of the summer vacation. We just love Italian food, now, don’t we? The chicken broth with bean and mushroom soup was brought to our table, I have tasted a chicken broth with mushrooms many times, even tasted it in little café’s in Italy, yet none of those compared with the distinct flavor this broth had. I think it was the flavor of a specific type of mushroom that was used in the soup to give it this simple aromatic flavour. The Antipasti, soft boiled eggs, with truffle flavor mashed potatoes, salad with parmesan shavings tasted, only okay. What gave the antipasti its character was the strong, unique flavor of truffle. The sharp, defining flavour, of the mashed potatoes, tasted good, but was lumpy. I have eaten soft boiled eggs, I have cooked soft boiled eggs and that was not it. These were hard boiled eggs, out from the refrigerator and onto my plate. I must mention here that the ciabatta and olive tapenade served alongside the courses was top class. That crisp crust of the bread, so soft inside with the strong olive flavour went down really well. The other mild dip that was served alongside the bread was, well, not great. I hate to sound cheap, but I love to eat the bread because it is neither listed on the menu nor chargeable on the bill! Skipping to the main course, I had ordered the diavola style chicken. 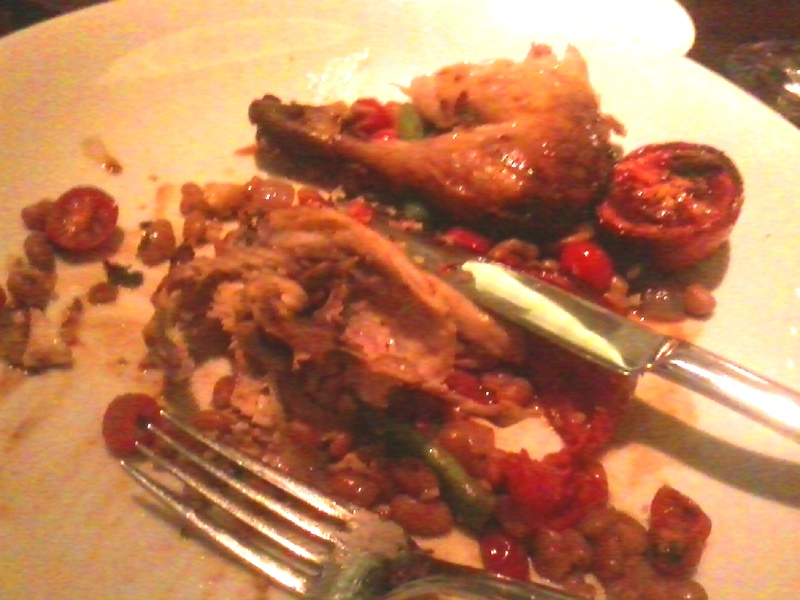 The portion size was large with two joints of chicken served with beans on my plate. I love it when my meal looks large and satisfying, if you have a small appetite; I suggest you skip the beginning courses to finish your extravagant poultry main course. The caramel colour skin of the chicken was soaked in its marinade, so full of flavour even on the inside of the chicken breast! The flavour and aroma of the wine in the sauce, served on top of the beans. A great marriage of colour and flavours was on my plate. I would love to go back to the Alto Vino for this diavolo style chicken, a treat for poultry lovers. Next in line for a taste was mom’s spinach and ricotta ravioli. It was creamy, mild and subtly delicious. This familiar item from the Italian selection, is a common favourite and for the Italian food lover, it is always something you can count on, when everything else seems unfamiliar. Although, this ravioli was good, it did not taste great, I have tried better tasting spinach and ricotta ravioli, many a times. Dad loves to steal a bite or two off our plates every now and then, but today was my turn to steal, not one or two bites, but nearly half his saffron risotto with prawns. You wouldn’t blame me, if you had tasted it yourself. This one compels you to sin. I can almost taste it as I begin to remember and describe the risotto to you. The prawn was fresh, cooked just right, juicy and full of flavour. 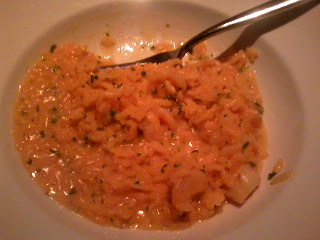 The risotto was creamy yet with a subtle, rich saffron flavour, ummm, so good! There was a very unique quality in this risotto, the defining flavour of saffron captured my senses, yet pronouncing all the other flavours of the seafood, the Arborio rice, the herbs in a mellow yet memorable song. The taste of the risotto just lingers on, I so wish I hadn’t tasted the mushroom ravioli in tomato sauce after the risotto. I am not sure whether my taste wisdom was influenced by what I had tasted before or was this dish really mediocre. 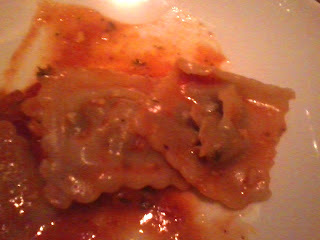 But, I can say, I love mushrooms but I did not like the mushroom ravioli. Something was amiss; the flavour of the mushroom in the ravioli was not pronounced and well married with the others. 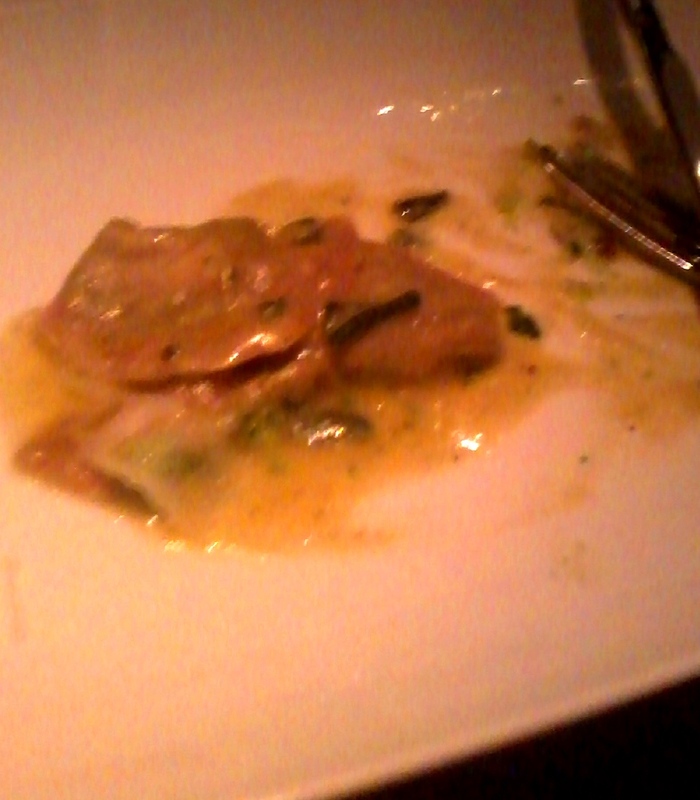 This dish does not have the quality to lure you back to this Italian joint. 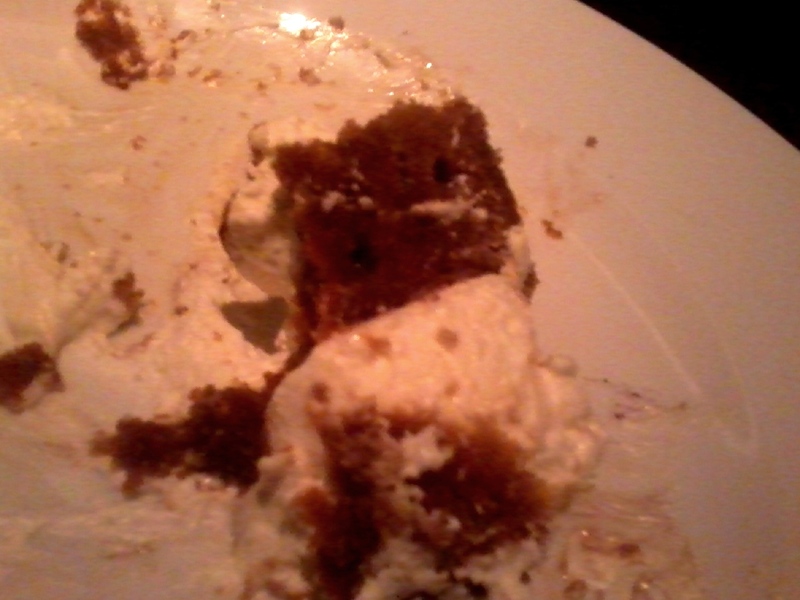 Anyway, let us move on to my sister’s favourite part, the dessert. Like many other Italian restaurants, Tiramisu, was not only on the menu but also the speciality of the house. All I can say is, if this is what their Tiramisu always tastes like then they better come up with a new recommendation for dessert. Whoever made this Tiramisu was extremely generous with all the ingredients, the coffee flavour was too strong, the dessert was too sweet and the cream was not light. Will I come back to Alto Vino? Yes, but certainly not for the Tiramisu! I already know what I am going to order next time, this time a plate full, may be two, I think you know too. Yes, the Saffron risotto with prawns.